Presented by Doctors & Emergency Nurses. The ONLY paediatric provider TRUSTED by Childrens Panadol & Powered by Priceline Pharmacy. If YOUR child was seriously SICK, INJURED or worse yet had NO PULSE and STOPPED BREATHING, would YOU know what to do? 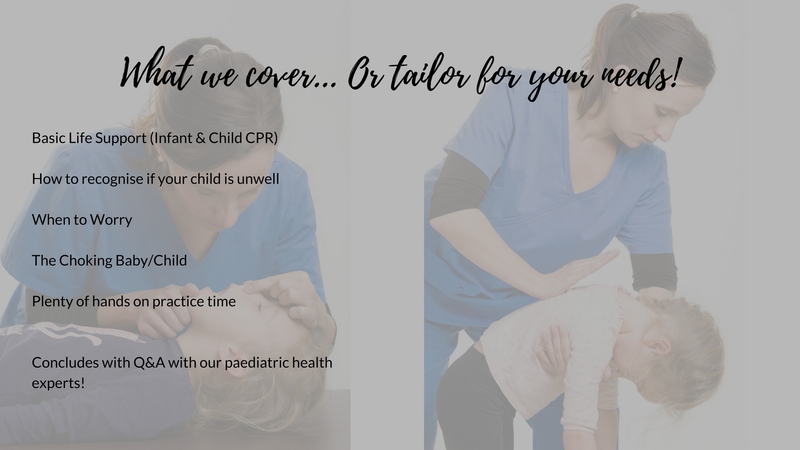 Established since 2010 with courses throughout Australia, KidzAid is recognised as the leading provider of Paediatric First Aid Training & CPR courses for parents, expecting parents, grandparents, teachers, child care providers and anyone else directly responsible for the care and safety of infants and children. Taught by our team of specialist instructors, our courses deliver a dynamic, engaging, interactive and totally practical hands on experience. During the course you will explore essential first aid topics from life support and CPR to the recognition and management of all accident and emergency presentations commonly seen and treated in hospital emergency departments, specifically, those encountered by infants and children in the first few years of life. We are so much more than just a first aid course! ‘When to Worry’, ‘How to Recognise and Respond’, Infant / Child CPR. They will go through the current up-to date best practice management of treating fevers, seizures, burns, drowning, choking, viral illness, allergies, use of analgesia in children and more! A comprehensive course manual and certificate of attendance (on request) is also provided to all candidates on completion of the course. PLUS each guest receives a free $10.00 Priceline Pharmacy gift card, to use in any store, with a 12-month expiry. 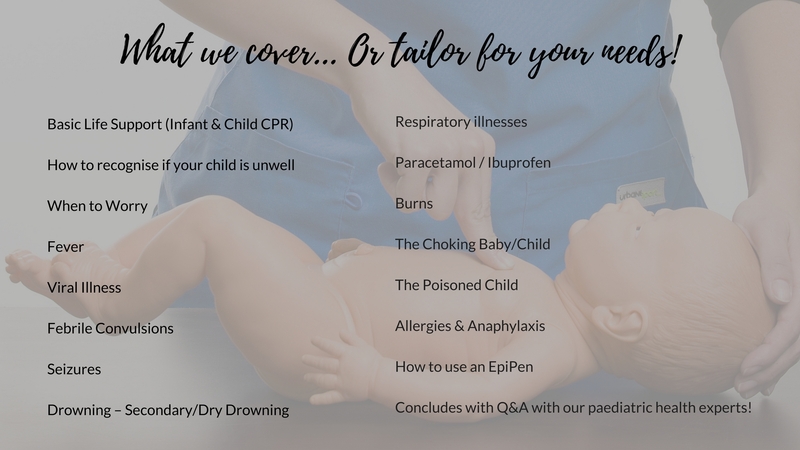 Our dynamic team of health professionals, including Emergency nurses, Doctors and Paramedics, have developed this hands on, interactive workshop and feel it is paramount that everyone responsible for children are equipped with these life saving skills. If you are short on time, the 1.5hr workshop is ideal and handy as a refresher. Exclusive private couples course (Vital Aid) @ $260.00* total, or (Essential Aid) @ $200.00* total gives you 1:1 with a medical professional – Emergency Nurse, Paediatric Doctors or Paramedic at your full disposal. That’s 1:1 in your home at a convenient time for you and your partner. Unsure which AID is best for your group? Let us tailor a specific workshop for your group requirements. Being that we aren’t just first aiders, but actual medical professionals, we can discuss any paediatric medical conditions and situations in our workshops.